Cell-Based Assay or Biochemical Assay? Cell-based and biochemical assays provide end users with valuable tools for drug discovery applications and high throughput screening. Cell-based assays, specifically, deliver biologically relevant information to predict the response of a drug on an organism by assessing the effects of a compound on cell viability, cell proliferation, or cytotoxicity that results in cell death. Alternatively, biochemical assays detect, quantify and/or study the binding or activity of biological molecules, such as enzymes. They can provide end users with further insights on the potential mechanism(s) of action of a compound and how these compounds influence enzymatic activity in canonical and/or non-canonical pathways. Enzo Life Sciences offers a comprehensive portfolio of assay kits, including scalable enzyme activity assays anchored by our FLUOR DE LYS® deacetylase assay platform, featuring kits for screening modulators of HDAC and Sirtuin activity. We also offer FRET-based assays for matrix metalloproteinases (MMPs) and caspase activity, as well as phospho-specific antibody-based kinase assays. In terms of cell-based assays, our panel of CELLESTIAL® fluorescence-based live cell assays is built upon our extensive expertise in the design and synthesis of fluorescent probes. From simple organelle specific dyes for imaging cell structure and determining cell viability, to more complex dyes for evaluating cell signaling and death pathways, each of our probes is developed to provide sensitivity, specificity, and convenience. Together, these assays exemplify the synergy of Enzo’s capabilities, assembling small peptide, active recombinant protein synthesis, fluorescent labeling and detection technologies, and antibody development into robust, reproducible assay kits. At Enzo Life Sciences, our aim is to enable scientists by providing numerous assays that measure or detect cellular events. Below we have highlighted commonly used assays in both cell-based and biochemical formats to assist in correct selection for a specific experimental design. We are happy to provide assistance in choosing the right kit for you! A simple assessment of cell viability can be the determination of the ratio of live to dead cells. 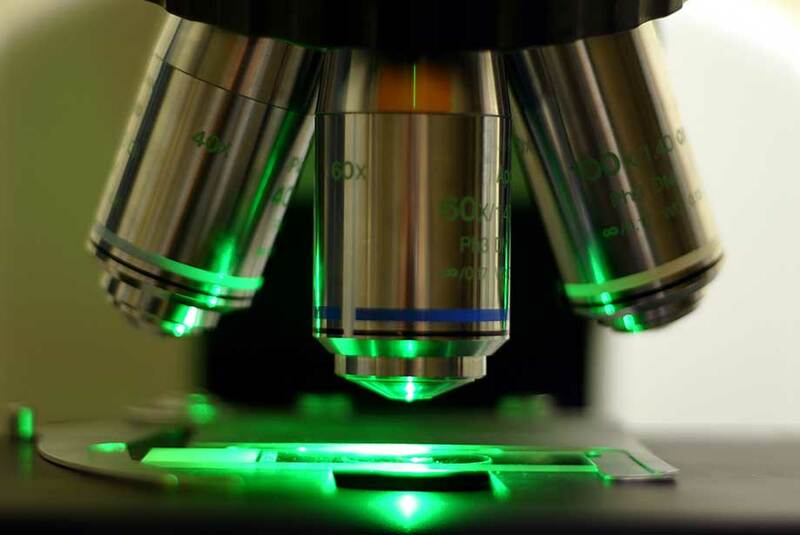 In regards to drug discovery, this can be essential for characterizing the effect of drug compounds on cells and used to optimize cell culture parameters. However, other assessments of cell viability can utilize different parameters that encompass examination of changes in cellular functions to understand how a drug compound influences cellular physiology. Some of these parameters can include examination of plasma membrane integrity, reactive oxygen species generation in mitochondria, or changes in cell cycle progression produced by changes in activity of cell cycle regulators that either stimulate or inhibit the cell from entering each stage of the cell cycle. Enzo’s CELLESTIAL® catalog offers a wide range of cell viability products to examine changes in cell function that may provide insights into cell viability. Our ApoSENSOR™ Cell Viability Assay utilizes bioluminescent detection of the ATP level for a rapid screening of apoptosis and cell proliferation simultaneously in mammalian cells. The assay utilizes luciferase to catalyze the formation of light from ATP and luciferin, and the light can be measured using a luminometer or Beta Counter. The ATP assay is the fastest cell viability assay to use, the most sensitive, and is less prone to artifacts than other viability assay methods. Additionally, our Live-Dead Cell Staining Kit provides ready-to-use staining reagents to conveniently discriminate between live and dead cells. The kit utilizes Live-Dye™, a cell-permeable green fluorescent dye (Ex/Em = 488/518nm), to stain live cells. Dead cells can be easily stained by propidium iodide (PI), a cell non-permeable red fluorescent dye (Ex/Em = 488/515nm). 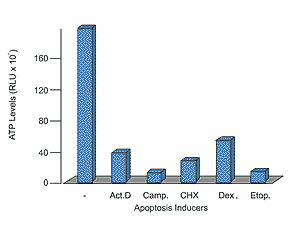 Figure 1: ApoSENSOR™ Cell Viability Assay effectively detects apoptosis. Apoptosis was induced in Jurkat cells and ATP levels were analyzed according to the kit instructions. Left: Time course showing decrease in ATP levels following induction of apoptosis with camptothecin. The decrease in ATP level correlates with the increase in annexin V positive staining cells detected by Annexin V-FITC Apoptosis Detection Kit according to the kit instructions. Right: Jurkat cells were treated with various apoptosis inducers as indicated for 12 hours and ATP levels decreased dramatically for all treatments. Cell-based assays that monitor subcellular organelle morphology are vital secondary screening assays because they can often provide further insights regarding the effects of a drug compound found from a conventional cell viability or cell death assay. Investigation of organelle morphology post drug exposure to cells offers end users a way to predict how morphology may be influenced in vivo without having to develop in vivo toxicity testing as a part of their experimental design. For these purposes, some our flagship products are our ORGANELLE-ID-RGB® III assay kit, MITO-ID® Green detection kit and LYSO-ID® Red cytotoxicity kit (GFP-CERTIFIED®). Our Organelle-ID-RGB III Assay Kit contains dyes selective for the golgi apparatus, endoplasmic reticulum and nucleus that are suitable for live staining. It comes in a simple one-tube format containing a green dye, which localizes to the Golgi Apparatus, a red dye, which is specifically designed to stain the endoplasmic reticulum, and nuclei blue (Hoechst 33342); this provides our end users with tools to examine ER-Golgi connections which serve a role in diffusing cargo proteins from the nucleus and recycling organelle-resident proteins. Our MITO-ID green detection kit is a fluorescent, photostable, non-toxic dye that stains mitochondria regardless of energetic state and is a useful tool for assessing morphological changes in mitochondria and estimating differences in mitochondrial mass. Lastly, our LYSO-ID Red cytotoxicity kit is able to monitor changes in lysosomal degradation using a drug-like cationic amphiphilic tracer (CAT) dye that selectively stains acidic organelles and can be suitable for monitoring the accumulation of lysosomes (or lack of accumulation) in secondary screening with test drug compounds. Figure 2. ORGANELLE-ID-RGB® III kit staining of MDCK epithelial cells. 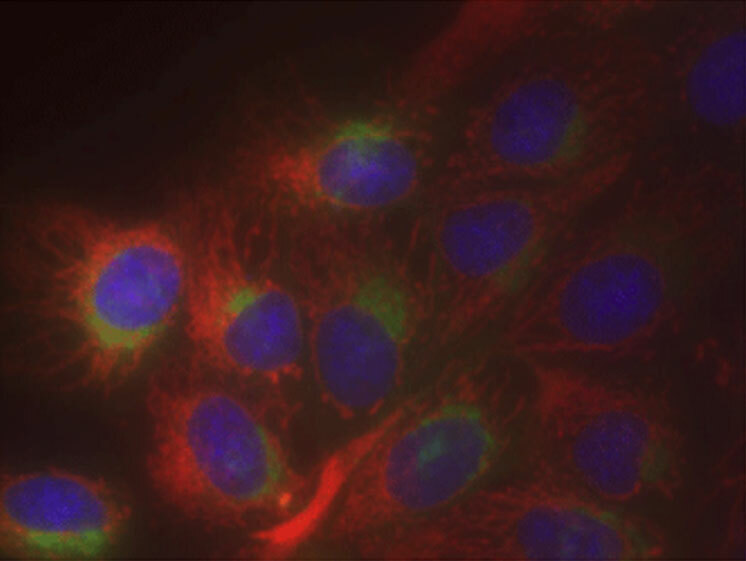 The ER-ID® Red, GOLGI-ID® Green and Hoechst 33342 (blue) dyes highlight their respective subcellular targets with high dependability. Cell proliferation is an increase in cell number over time as a byproduct of cell division. Observing cell proliferation in regular tissue and cellular homeostasis is essential for characterizing drug compounds and their effect on proper growth, development, and maintenance of organism. Our Cell Counting Kit-8 provides a sensitive colorimetric assay for the determination of cell viability in cell proliferation and cytotoxicity assays. The assay utilizes a highly water-soluble tetrazolium salt, WST-8, which is reduced by dehydrogenase activities in live cells to give a yellow-color formazan dye. WST-8 is more stable and less cytotoxic compared to other tetrazolium salts, making it especially useful for longer incubation periods. The amount of the formazan dye, generated by the activities of dehydrogenases in cells, is directly proportional to the number of living cells. 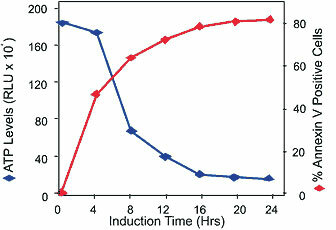 Figure 3: CTLL-2 cells were incubated with various concentrations of IL-2 for 72 hours. CCK-8 solution was added to each well and the absorbance at 450nm was measured. IL-2 exposure resulted in an increased absorbance which correlates to an increase in cell proliferation. 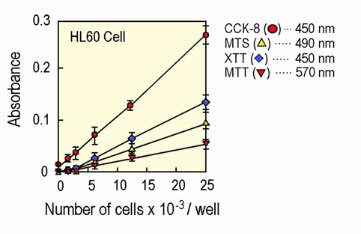 CCK-8 shows greatest sensitivity. Cytotoxicity assays assess the degree of toxicity to cells under a treatment with a drug candidate or pharmacological agent in an experimental design. Enzo provides a variety of assays to quantify cytotoxicity in cells. One of the most commonly used markers in cytotoxicity studies is LDH. As a result, we have developed our LDH Cytotoxicity WST Assay which is a colorimetric assay kit used to determine cytotoxicity by measuring lactate dehydrogenase activity released from damaged cells. Lactate dehydrogenase (LDH) is an enzyme present in all cell types which is released into cell culture medium upon damage of the plasma membrane. LDH catalyzes the dehydrogenation of lactate to pyruvate, reducing NAD to NADH. The NADH produced reduces water soluble tetrozolium salt (WST) in the presence of an electron mediator to produce an orange formazan dye. The amount of formazan produced is proportional to the amount of LDH released in the medium, indicating cytotoxicity. Figure 4: Mechanism for LDH Cytotoxicity WST Assay. Apoptotic cell death is a highly conserved cascade of proteolytic events accomplished by caspases. These proteolytic enzymes are synthesized as inactive proenzymes that become activated after cleavage at specific aspartate resides. Typically, caspases are present inactive precursors but undergo a transition that initiates caspase activation during development or pathogenesis of various pathologies in a controlled fashion through responding to extrinsic or intrinsic signals. Hallmarks of apoptotic cell death include exposure of phosphatidylserine on the extracellular face of the plasma membrane, activation of caspases, disruption of mitochondrial membrane potential, cell shrinkage, DNA fragmentation and DNA condensation. Determining the stage of apoptosis or necrosis is of particular interest to several research areas ranging from target identification and validation to small molecule efficacy and toxicity. To study apoptotic or necrotic cell death, we offer our GFP-CERTIFIED® Apoptosis/Necrosis Detection Kit, which distinguishes between healthy, early apoptotic, late apoptotic and necrotic cells and is compatible with GFP and other green fluorescent probes. Phospholipid binding proteins such as Annexin V possess a high affinity for phosphatidylserine and readily bind in the presence of Ca2+. Given that Annexin V is not cell permeable, the binding of externalized PS is selective for early apoptotic cells. As a cell trends towards necrosis, membranes continue to degrade, allowing non-permeable detection reagents, such as Necrosis Detection Reagent, to intercalate into guanine rich regions of the DNA and provide additional information. Cells that are in late apoptosis or early necrosis demonstrate signal for both Annexin V and Necrosis stain. Figure 5. Flow cytometry. Jurkat cells were mock-induced with 0.2% DMSO (panel A) or induced with 2uM Staurosporine (panel B) for 4 hrs. at 37°C. After treatment, cells were incubated with a buffer containing Annexin V-Cyanine 3 and the Necrosis Detection Reagent (Red), a far red emitting DNA-intercalating dye, then analyzed by flow cytometry using a 488nm laser with fluorescence detection with FL2 (Apoptosis Detection Reagent) and FL3 (Necrosis Detection Reagent) channels. Mock-induced cells were primarily negative for apoptosis and necrosis. After a 4 hour treatment, there were three populations of cells: (1) cells that were viable and not apoptotic or necrotic (Annexin V-Cyanine 3 and Necrosis Detection Reagent negative); (2) cells undergoing apoptosis (Annexin V-cyanine 3 positive and NDR negative); and (3) cells undergoing late-stage apoptosis and early necrosis (Annexin V-Cyanine 3 and Necrosis Detection Reagent positive). Enzo developed a broad-class of HDAC/Sirtuin screening assays available in chemiluminescent, fluorescent and colorimetric formats to enable end users to screen test compounds for activation or inhibition of enzymatic activity amongst the various HDACs and SIRTs. The FLUOR DE LYS® SIRT1 fluorometric drug discovery assay kit is a complete assay system designed to measure the lysyl deacetylase activity of the recombinant human SIRT1 included in the kit. The assay procedure has two steps. First, the FLUOR DE LYS® SIRT1 Substrate, which contains a peptide comprising amino acids 379-382 of human p53 (Arg-His-Lys-Lys(Ac)), undergoes deacetylation of the substrate. This sensitizes the substrate so that, in the second step, treatment with the FLUOR DE LYS® Developer II produces a fluorophore. We have optimized the FLUOR DE LYS Platform for the fluorescent measurement of HDAC 1, 3, 6, and 8 as well as SIRT 2, 3, and 5. The CHEMILUM DE LYS® system (Chemiluminescent Histone deAcetylase Lysyl Substrate/Developer) is a highly sensitive and convenient alternative to radiolabeled, acetylated histones or peptide/HPLC methods for the assay of histone deacetylases. The assay procedure has three steps (Fig. 1). First, the CHEMILUM DE LYS® Substrate, which is comprised of an acetylated lysine side chain, is incubated with a sample containing HDAC activity (HeLa nuclear or other extract, purified enzyme, bead-bound immunocomplex, etc.). Deacetylation of the substrate sensitizes the substrate so that, in the second step, treatment with the CHEMILUM DE LYS® Developer followed by Enhancer produces light. 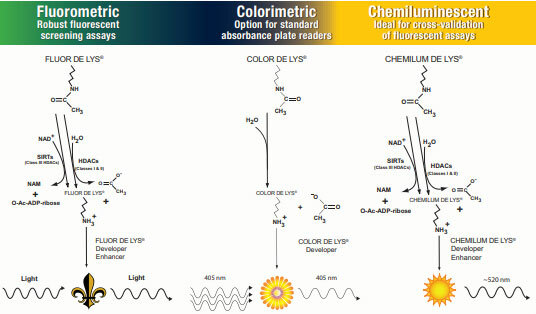 Our colorimetric system, COLOR DE LYS® system (Colorimetric Histone de Acetylase Lysyl Substrate/Developer) operates in a similar manner except deacetylation of the substrate sensitizes the substrate, so that in the second phase of the assay, when the COLOR DE LYS® developer is mixed with the substrate, an increase in yellow color intensity occurs. Our high-quality chemiluminescent, fluorescent, and colorimetric assays deliver more high-quality hits, and are backed by a broad panel of characterized inhibitors and PTM-specific antibodies for ubiquitinylation, sumoylation, methylation, acetylation, and phosphorylation. Figure 6. FLUOR DE LYS® deacetylase assay platform for screening HDAC & Sirtuin activity. Proteins of the matrix metalloproproteinase (MMP) family are collectively involved in the breakdown of extracellular matrix proteins and processing of bioactive molecules and are required for some normal processes making MMPs prime targets for chemical library screening. By developing long wavelength quenched fluorogenic substrates, we have designed our MMP RED and GREEN Drug Discovery Assay Kits to be able to screen test compounds that can examine activation or inhibition of a variety of MMPs. The assays are performed in a convenient 96-well microplate format with the compound NNGH also included as a prototypic control inhibitor. This kit offers an improved red-shifted substrate with better kinetics and brighter signal, allowing for lower substrate concentrations and resulting in less compound interference to enable an accurate and real-time assessment of the kinetics of cleavage in MMPs. 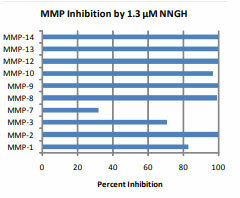 Figure 7: Inhibition of ten MMPs by 1.3 µM NNGH. 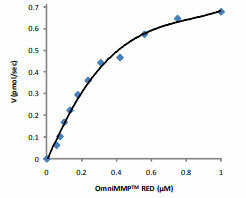 Determination of kcat/Km for MMP-1 using OmniMMPTM RED. Km = 0.48 µM, kcat/Km = 6.7 x 106 M-1sec-1. At Enzo Life Sciences, we offer a wide product range to examine the effects of drug compounds through our enzyme activity assays and cell-based assays. Please check out our Enzyme Activity Assay platform and our CELLESTIAL Live Cell Analysis portfolio to learn more about what specific technologies we are able to provide you. Additionally, please see some successful tips we’ve come up with for using our cell-based and high content screening assays on our website. For further assistance or information regarding the products, please feel free to contact our Technical Support Team.